Fall and Winter are prime times to bake items that compliment our seasonal soups and stews. 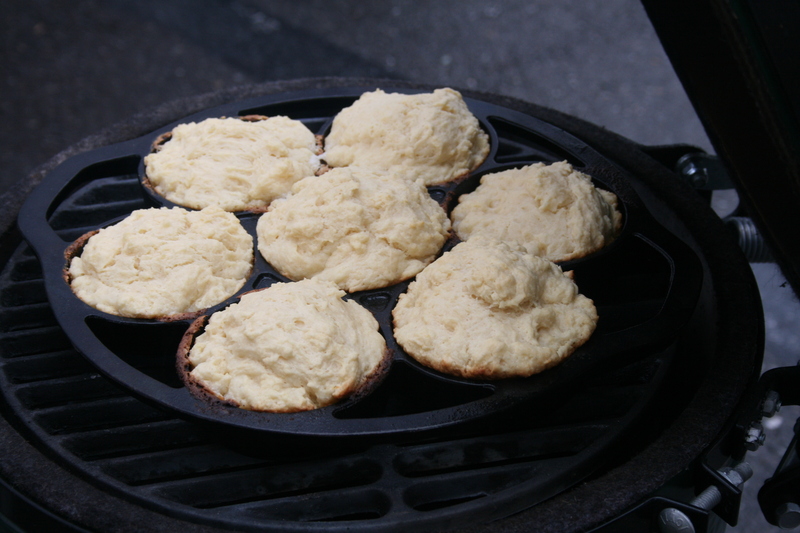 We’ve come across this old world style Drop Biscuit recipe and modified it a bit for the Big Green Egg. We’ve got a small Big Green Egg that loves to hover at 400F with ease and decided to put it to use. Tools: Big Green Egg or other BBQ cooker that can maintain constant 400F indirect temperatures. Lodge cast iron biscuit pan. Cooker Temp: 400F, indirect heat. Option: Feel free to add herbs of your choice to the biscuits as well. Wisk the flour, baking powder, sugar, salt, and baking soda together in a large bowl. Mix the buttermilk and melted butter (8 tablespoons) together in a separate bowl. Combine the buttermilk mixture with the dry ingredients and stir with a rubber spatula until incorporated and batter pulls away from the sides of the bowl.